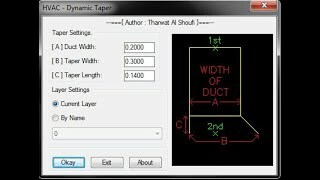 This HVAC Taper Transition Program provides a connection of HVAC Duct between the Diffuser and Grill to the main duct. It is as simple as that. You can use this program for 100 times. After the expiry of the program, you will receive a dialog showing the serial number (codes) of your PC and my Email ID. Please send me an email including the serial number. After receiving your payment, I will send you the full version. NOTE: you can get the full version of the program before the program expires by pressing the Activate button that is available in the same dialog of the program. You can use this program for 100 times. After the expiry of the program, you will receive a dialog showing the serial number (codes) of your PC and my Email ID.